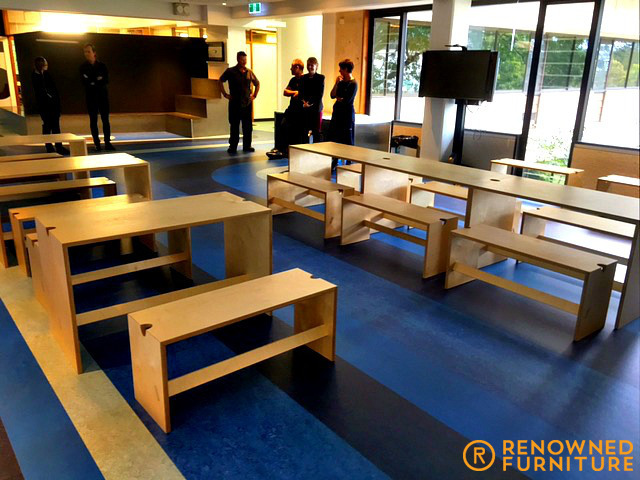 Renowned Furniture was commissioned by the School of Architecture of the University of Queensland to make something that provides multi use, sustainability and inspiration for one of the students common area. 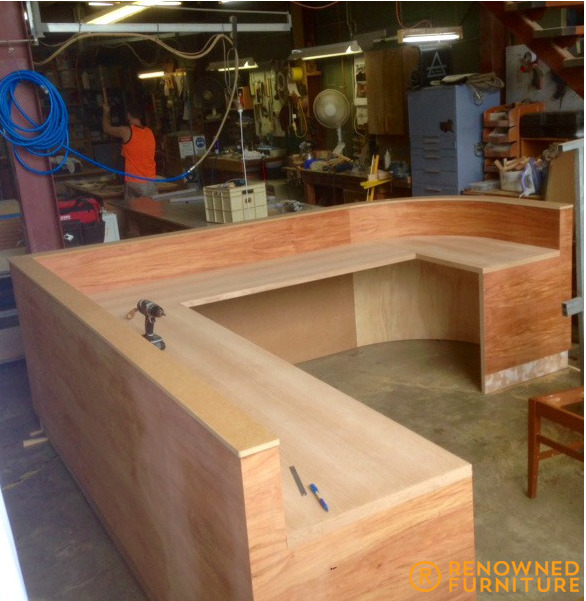 Here are the finished seats and tables positioned and ready to work! They are multi use pieces that can be turned upside down and used as art work stands as well. The way of the future: Low footprint/multi use. 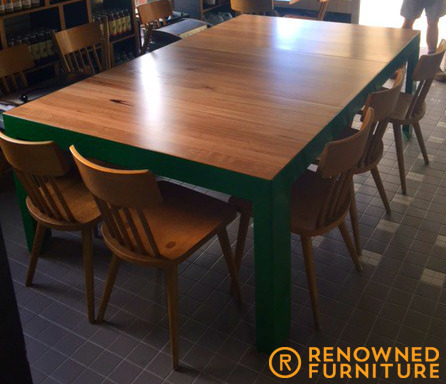 The client was so pleased with the quality and finish of our work that they have ordered 6 more tables and 8 more seats to complete the room. 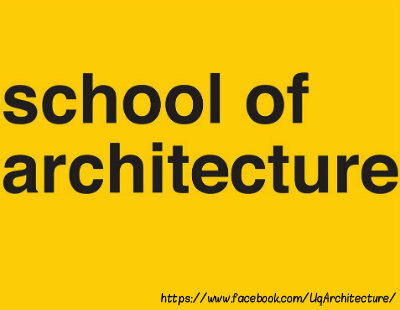 Renowned Furniture is proud to be a part of such a prestigious institution where tomorrow’s architectural leaders are being shaped and nurtured. If you have a moment, take a look at their Facebook page and how they are moulding these future leaders. Grace had Renowned restore a number of her care chairs. 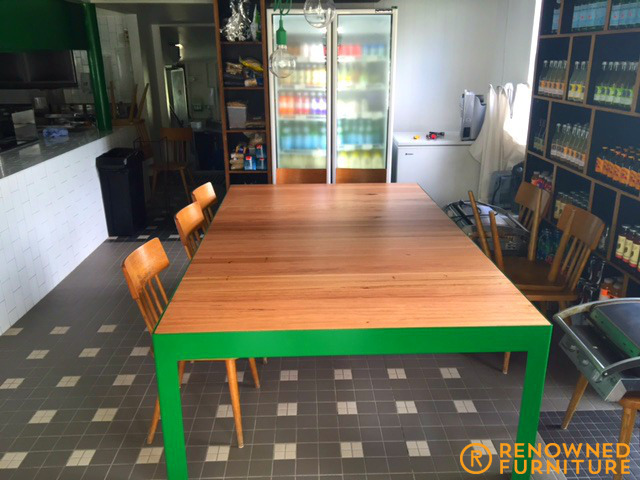 The Café is a great spot for weekend warriors and Grace was so impressed with the job we did on the chairs that she asked us to refurbish her main dining table. 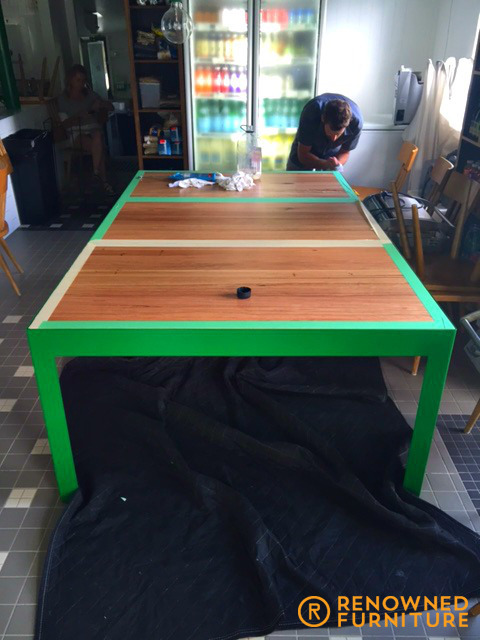 Solid spotted gum slats (now all jointed) with a green powder coated frame! Quite a centrepiece! 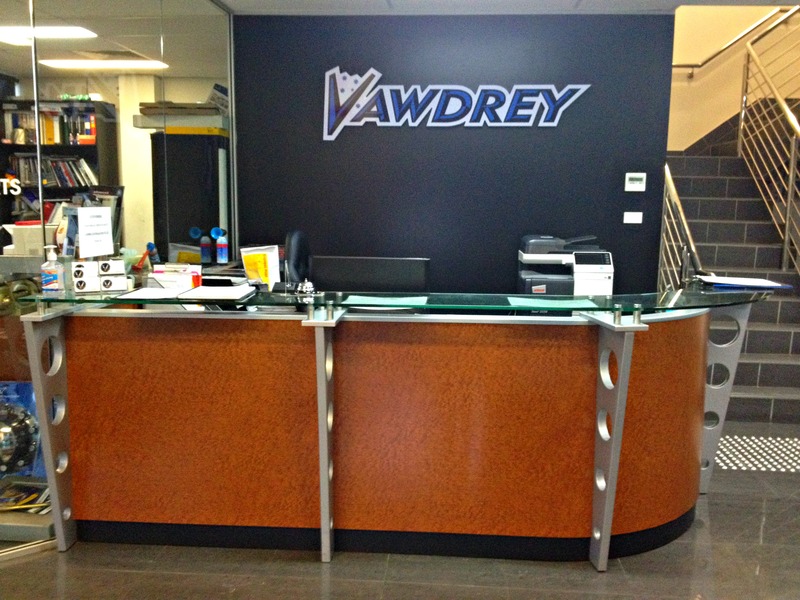 The Vawdrey reception desk is complete! 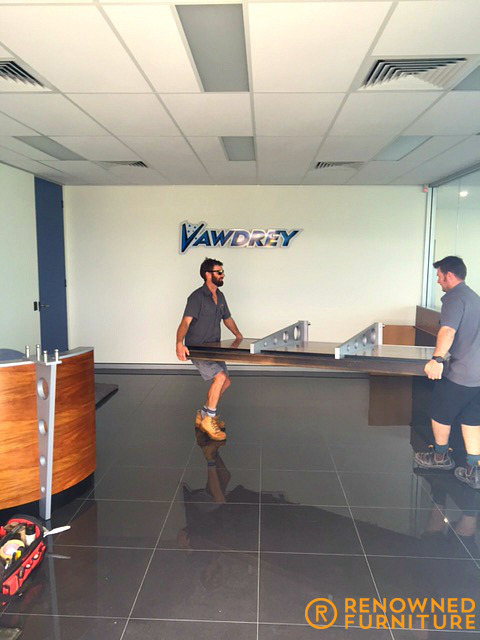 The Vawdrey group makes trailers for big road haulage trucks. 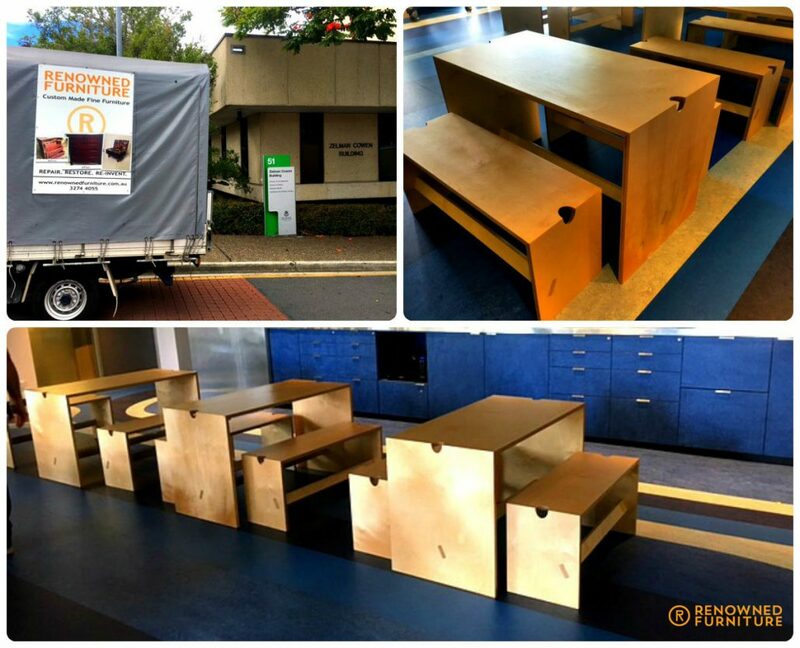 They’re building a flash new Queensland office, and what we did for them is a “Make one like this, please” project. 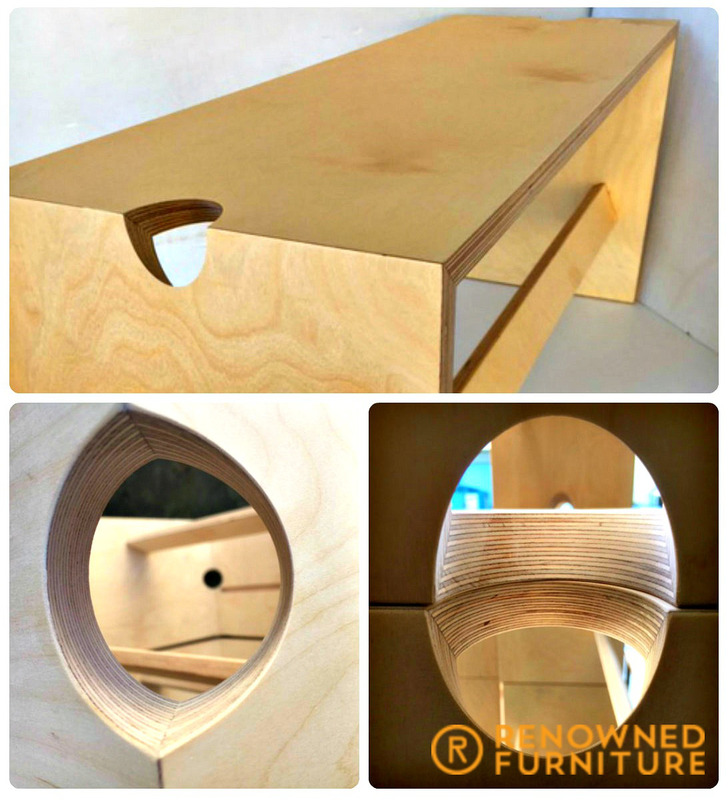 We think the client will be impressed with our little extras in craftsmanship and finishes. 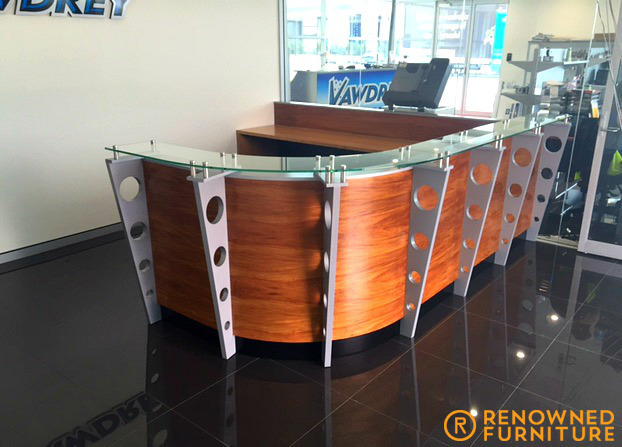 Renowned Furniture have been getting pulled into the commercial space of fine furniture making and supply over the past few years and we feel that the clients are seeing the benefits of dealing with a supplier willing to flex to their specific requirements. Well, the boys are “head’s down, backs straight! Getting through this commissioning job for Vawdrey! What a great show piece for the many visitors as they arrive in Vawdrey’s flash new facility. 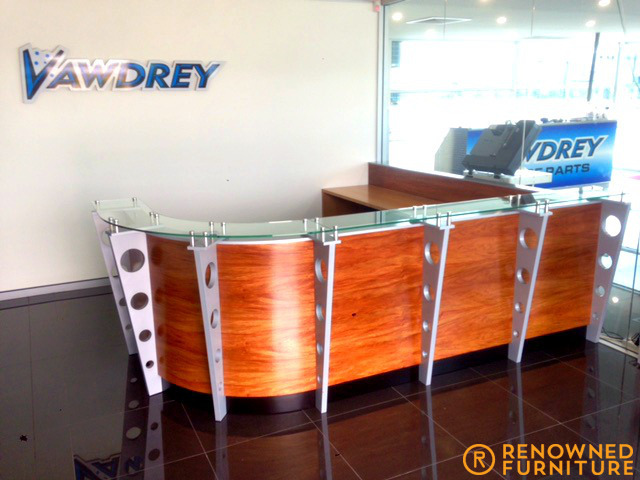 The fronts, curved section moulded out of several layers of bonded bending plywood and then overlaid with a New Guinea Rosewood timber veneer. 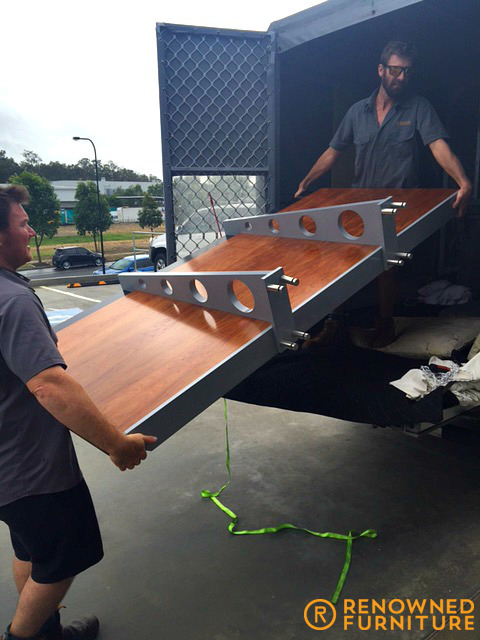 The silver blades (made to look a little like the structural ribs that make up a semi-trailer frame) are constructed from solid core mdf and 2 pack painted using automotive paint, there are stainless steel boss stand-offs supporting 10 mm thick custom toughened glass for the floating tops. The work tops are solid core veneer done in American oak. 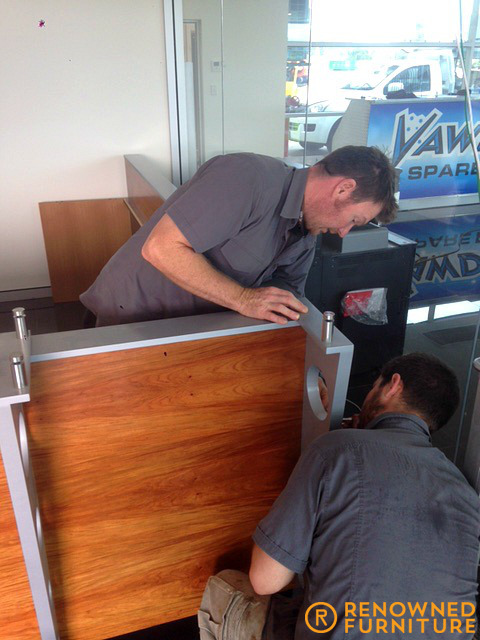 Here are the boys at Vawdrey’s site for the desk installation. 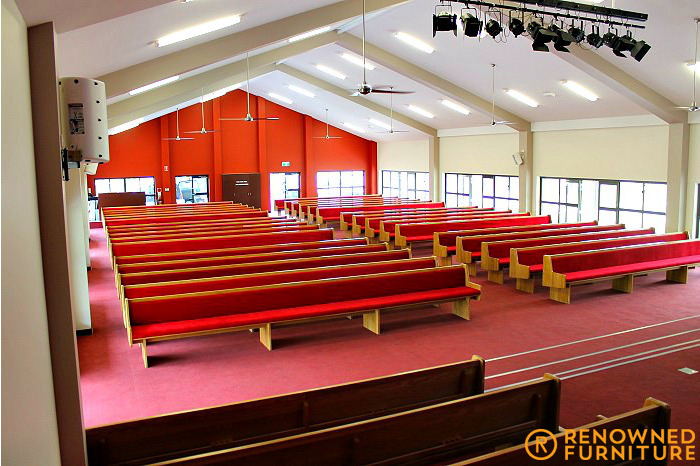 The fronts, curved section moulded out of several layers of bonded bending plywood and then overlaid with a New Guinea Rosewood timber veneer, The silver blades (made to look a little like the structural ribs that make up a semi-trailer frame are constructed from solid core mdf and 2 pack painted using automotive paint. 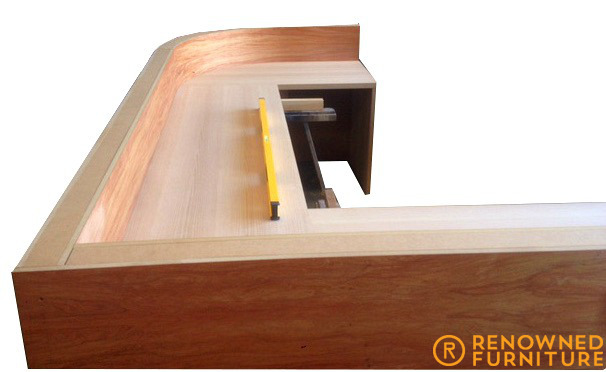 There are stainless steel boss stand-offs supporting 10 mm thick custom toughened glass for the floating tops. The worktops are solid core veneer done in American oak. 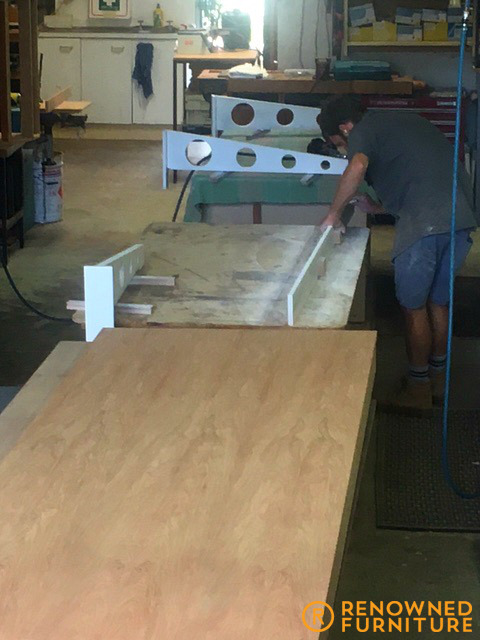 More progress for the Vawdrey reception desk – with the spars, blades already built and undercoated. Watch this space for the finished product! 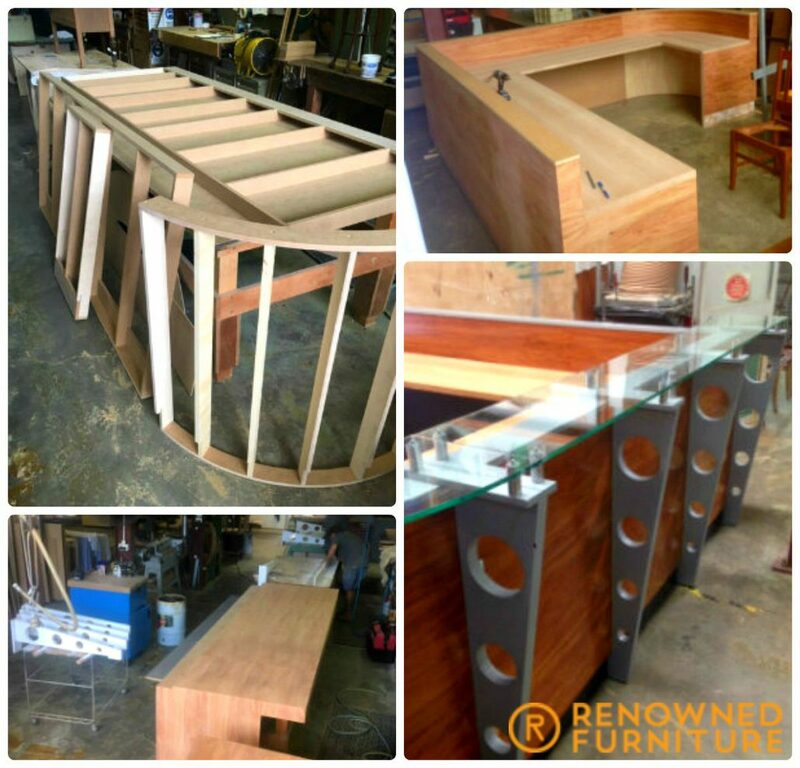 Progress is good for the Vawdrey reception project – New Guinea Rosewood front, American oak desktops and custom curved sides. 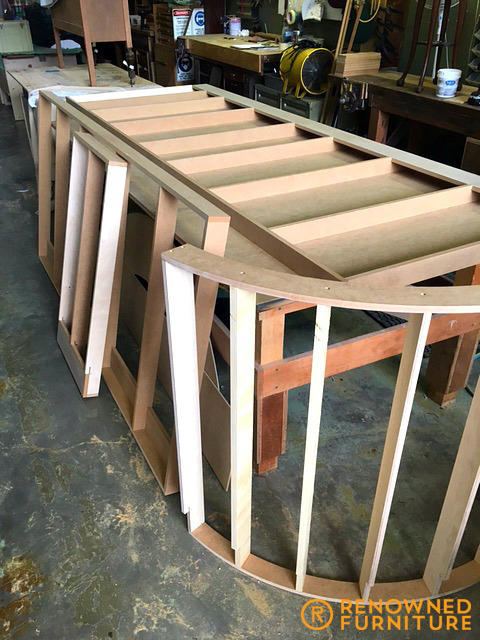 We have all the materials here, including the finished timber for the outer front section, which came to us via special courier from the Gold Coast. We have made the templates for the silver spars that go down the front and these were CNC machined during Easter. We have also prepared the templates for the glass tops. Last time we did one of these, it was the GPS Rugby trophy that dated back to the early 1900’s! 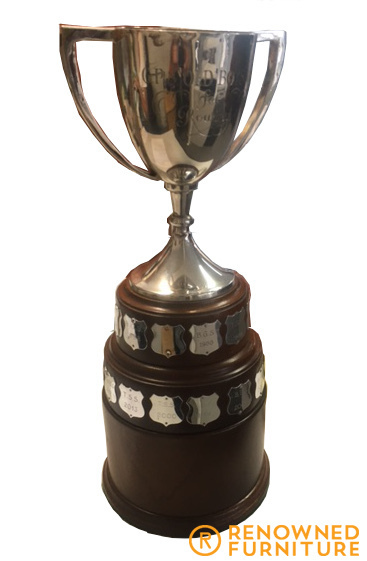 This time it’s the GPS rowing trophy that has “run out of room” where the annual winners get their name in history! Well, now it’s ready for what we calculate to be another 28 years! WTS! The guys at Sharp were over the moon with the results of the restoration. 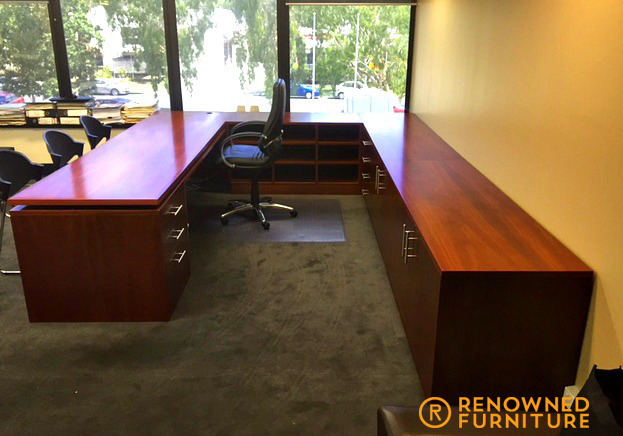 After shards of glass, hail stones and water ruined this semi-built-in desk and returns, 2 other furniture companies suggested that the unit would have to be replaced! We took the job, and in the process we helped reduce landfill waste and the client’s insurance company saved more than $2,500 restoring rather than replacing. 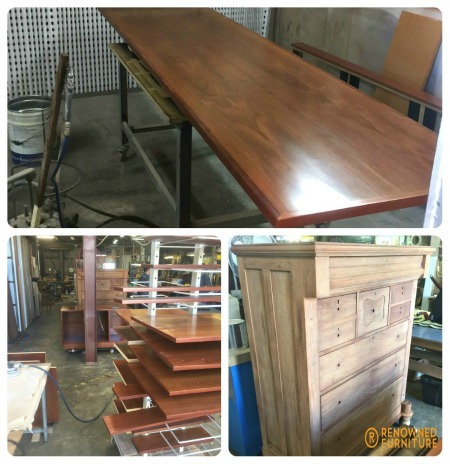 From the outset, we want to make very clear that we endorse the concept of importing furniture, and we have engaged with companies from countries such as China for certain projects where quantity is required. 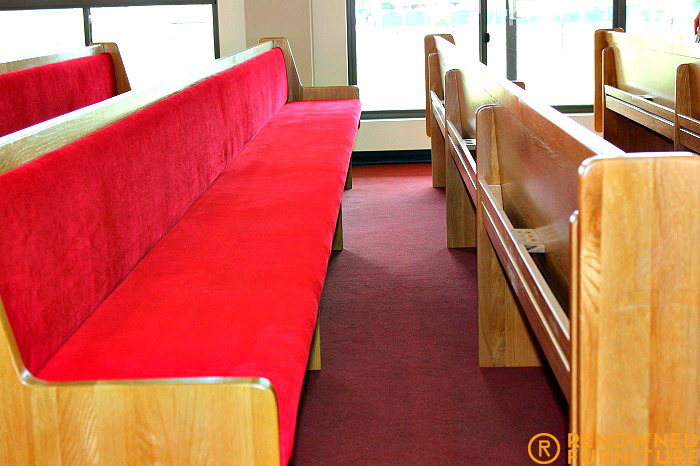 We recently did a $250,000.00 job for a church and made solid oak church seating for 400 parishioners. We used a reputable local importer, but we also flew one of our craftsmen to the factory in China with a scale model (prototype) to meet and talk with the manufacturers, and we then flew back three weeks later to approve quality and process. The whole project was a massive success, and we’d do it again tomorrow if the need arose. There are a couple of important things to be mindful of. 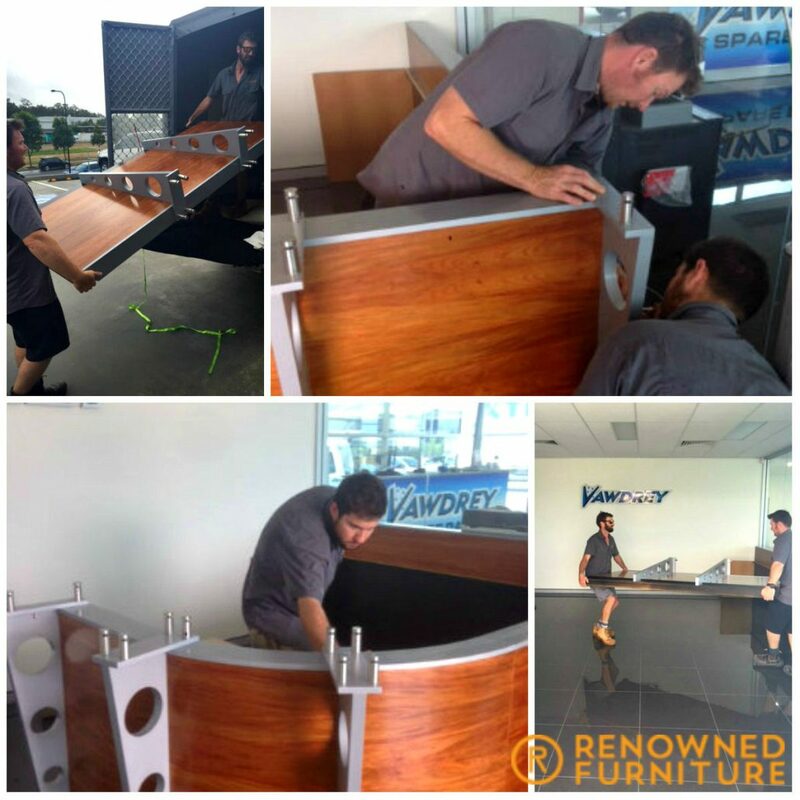 First, reputable Australian firms that import furniture made offshore do spend the time and money to ensure quality standards are met. But some less known or on-line companies do not. Second, while they may look great in the pictures, often the products (once received) are way below par – not what you ordered or simply unsafe. That’s when Renowned Furniture gets called to help. 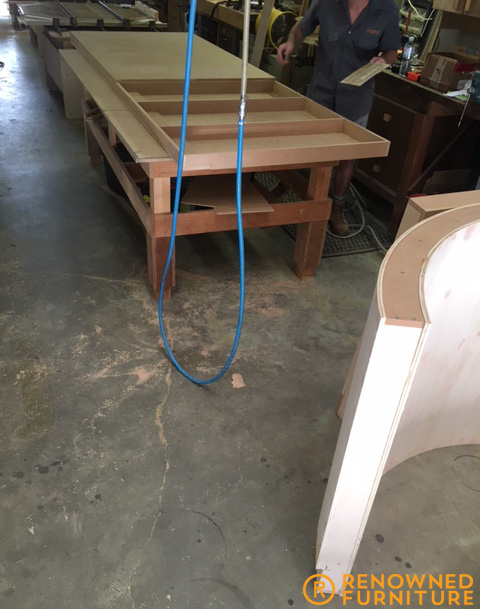 We show up in on-line searches for furniture repair and are contacted for assistance. In many instances, we’re fine to help, and in most instances, our repair quote is more than double the original cost of any one piece. But that’s not the fault of Renowned Furniture; it’s driven by what we need to pay our team of master craftsmen in reasonable Australian wages and local costs. 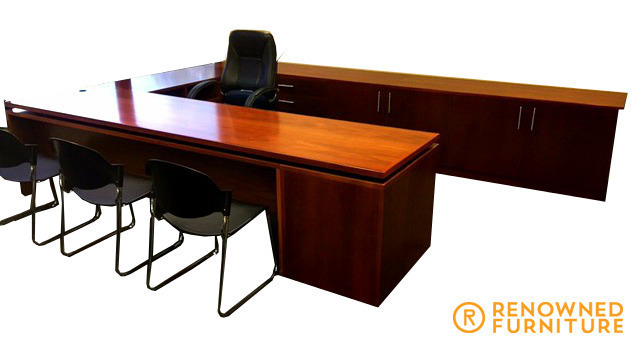 There are quality imported furniture and there are reputable overseas furniture manufacturers/suppliers. Just don’t forget to do your research before making your purchase. Starting 2016 with a Blast! Wow! 2016 has kicked in with a whole host of new jobs. Even some that are only now being restored following that mighty storm we had here in Brisbane in 2014! This classic silky oak lounge suite was sprayed in shards of shattered glass, so it will have to be fully striped apart and redone. 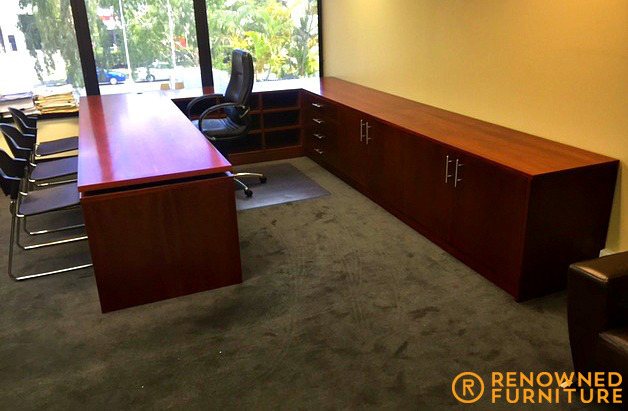 Also on our pipeline is a suite of office furniture as well as an antique cedar chest of drawers. There’s more! 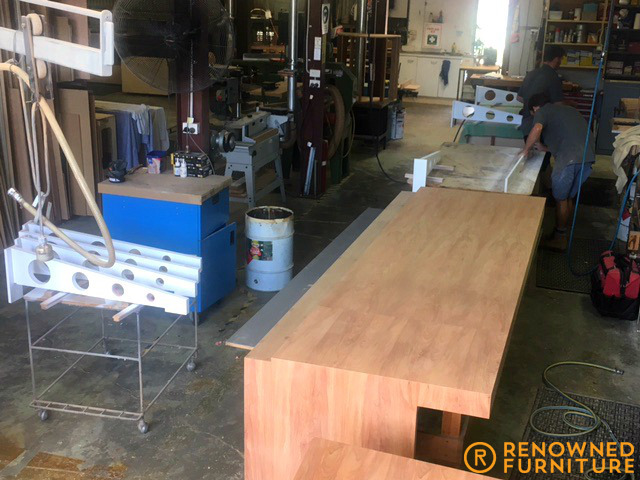 We have almost completed the 3 solid silky oak bar stools with black leather upholstered seats. So there’s plenty of reasons to “Watch this space” as we crank up for another record year. If we look at our year to date sales turnover as we are now half way through the ‘15/’16 financial year, we are already surpassing last financial year’s figures. So in the past 3 years, our figures are more than double than of any previous years! I’m sorry, did someone say downturn? What downturn!! It’s all about delivering quality and telling the world. 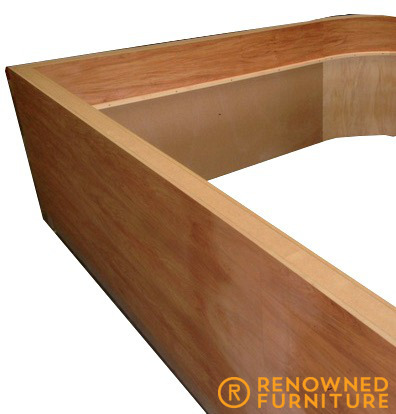 http://renownedfurniture.com.au/wp-content/uploads/2014/12/logo1.png 0 0 Ross http://renownedfurniture.com.au/wp-content/uploads/2014/12/logo1.png Ross2016-01-07 04:26:092016-01-07 07:40:24Starting 2016 with a Blast!